The private spaceflight company SpaceX launched two communications satellites to space Sunday (March 1) from Florida. Watch a video of the launch. The private spaceflight company SpaceX launched a pair of communications satellites to space Sunday (March 1), and you can see amazing videos and photos of the liftoff. A SpaceX Falcon 9 rocket blasted off from Cape Canaveral Air Force Station, Florida at 10:50 p.m. EST (0350 March 2 GMT) carrying the ABS 3A and EUTELSAT 115 West B satellites to orbit. If you missed it, don't fret. You can still watch video highlights of the SpaceX launch. "Both satellites deployed on target. Now firing their ion thrusters to reach geo station [geostationary orbit] over Europe & Asia," SpaceX founder Elon Musk wrote on Twitter just after liftoff. "Next launch in three weeks." The two satellites are the "first all-electric propulsion satellites, they carry no liquid propellant – rather, they reach orbit entirely via a lighter and more efficient electric propulsion system," SpaceX representatives wrote in a news release. You can watch one of the satellites deploy from the Falcon 9 rocket in a Vine video as well. Boeing built the two satellites, and the company confirmed that the pair of spacecraft appears to be in good shape after launch, beaming back their first signals from space today (March 2). "By launching the satellites as a pair, Boeing customers can save on launch costs while benefitting from the company's highly capable and flexible platforms to meet their mission requirements," Mark Spiwak, Boeing Satellite Systems International president said in a statement. 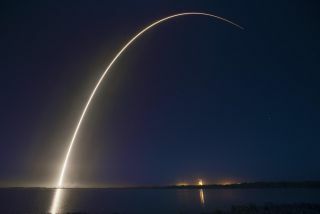 SpaceX has recently attempted a series of reusable rocket tests in which ground controllers attempt to fly the boost stage of the Falcon 9 rocket back to Earth after launching a payload to space. The booster either tries to land upright in the ocean or on a floating platform in the water, but SpaceX representatives did not try the fly-back during this launch because the rocket didn't carry enough propellant, according to Musk. The spaceflight company will not attempt a fly back with the next Falcon 9 launch, however, Musk wrote on Twitter that he expects the firm will try another reusability test with the launch after that. SpaceX is due to launch again in three weeks.